31 percent of building materials, such as carpet and bathroom countertops, are made from recycled content. Roof-mounted solar panels are used to pre-heat domestic hot water. 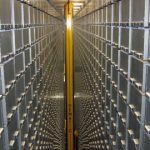 This helps contribute to a 31 percent reduction in energy usage. 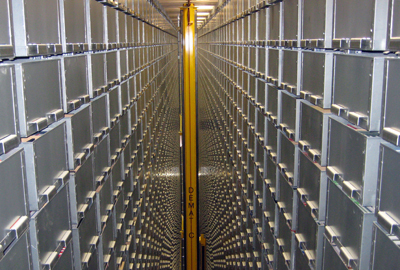 The Bookbot book storage and retrieval system allowed the building to be 40 percent smaller than it would have been if traditional book stacks were used. Ultra low flow plumbing fixtures use 38 percent less water than typical fixtures. Plus, the building is piped for future use reclaimed wastewater. Once available to the building, this will allow for non-potable water to serve all toilets and urinals. 82 percent of all wood products throughout the building are harvested from FSC-certified timber forests. Bike storage, showers and changing rooms are provided to encourage alternative transportation. 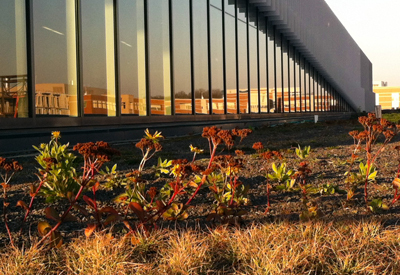 A vegetated green roof helps control rainwater runoff. A 30 percent increase in fresh air intake provides improved air quality for building occupants. 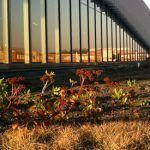 These sustainable features, plus many others, are expected to help Hunt Library achieve LEED certification for leadership in energy and environmental design. Just another way NC State is leading the Pack toward a more sustainable campus, community and world.